Box shows whitening on corners. Components in excellent shape and bagged. Some cards have a slightly visible bow due to shuffling and the tip of the warp gate is slightly damaged. The game really looks like it has only been play once or twice. 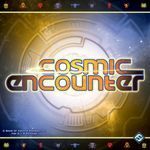 Includes Cosmic Encounter: Cosmic Incursion. Opened but not punched/used. No box as all components and rules will be in the base game box.